The most anticipated week on the PGA Tour is finally here as the 2019 Masters Tournament kicks off on Wednesday with the Par 3 competition. This year's field is made up of 86 players plus the winner of the Valero Texas Open(if not already in the field). The cut is another unique thing about the Masters as the Top 50 and ties plus any golfer within 10 strokes of the lead after Friday's round move on to the weekend. 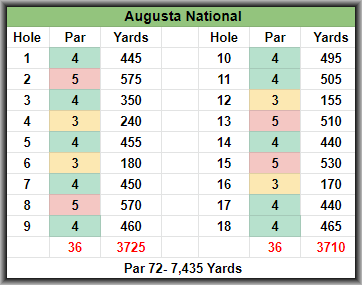 From a statistical standpoint, it is hard to narrow it down to a just a couple stats as Augusta will challenge every facet of a golfers game. Distance can definitely be an advantage especially on the Par 4, 10th and 11th holes that are 495 and 505 yards respectively. Speaking of the Par 4's, that is a spot I will be concentrating on for a couple of reasons. The four Par 5 holes are the easiest on the course and should be had by most of the field. Where I feel golfers can separate themselves is on the Par 4's which are much tougher. Going back to 2012(via Fantasy National Golf Club), the winner has led the field in Strokes Gained: Par 4 Scoring four times, finished Top 5 six times and 8th or better in all seven of those Masters. That same winner has finished 20th or worse in Par 5 Scoring three times with Patrick Reed leading both last year. 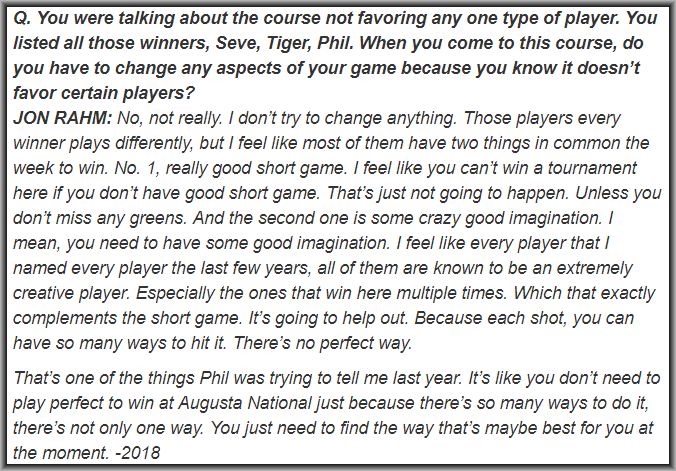 We can also pull a lot from the following Jon Rahm quote from last year. Biggest takeaway? Short game, short game, short game! It makes sense as the greens are large but multi-tiered, very fast and have shaved edges which, on some holes, eliminates portions of the green for landing zones. The very tough greens also bring three-putt avoidance in play. Patrick Reed talked last year about some courses it not mattering above or below the hole from six feet but here a six-foot downhill is 100% more difficult than an uphill putt of the same length. 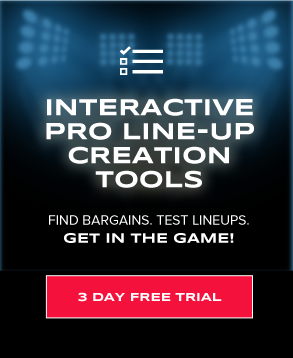 Using Fantasy National, I will also be looking at Strokes Gained: Putting on Fast Greens. 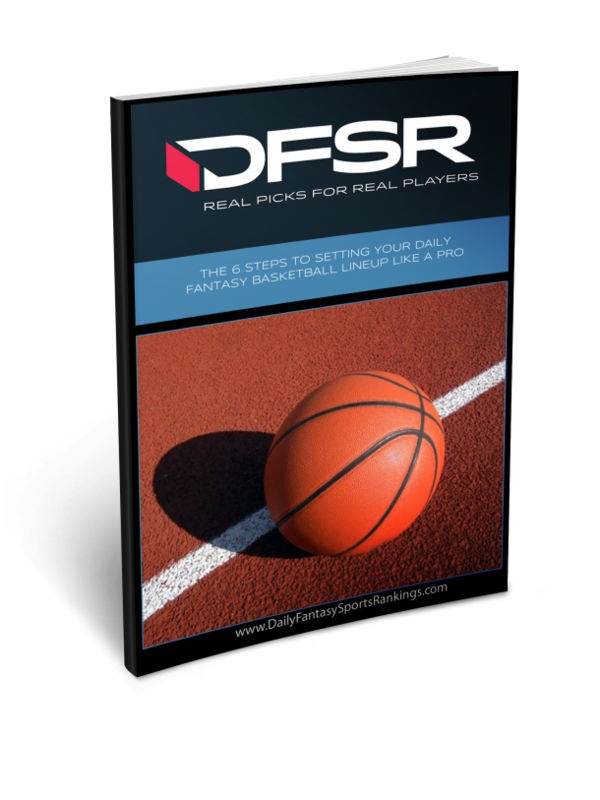 With that, lets take a look at the course and then jump into the picks. McIlroy is #1 in my model which is impressive considering the elite company at the top with course history and form. McIlroy is first in the form rankings on my sheet coming off a win at the PLAYERS and has finished 6th or better in all six events in 2019. He is looking to complete the career Grand Slam with a win at Augusta and has come very close lately with five straight Top 10 finishes here including a T5 last year after entering the final round in the final group with Reed. Hard not to roster and/or bet on him year in and year out until he wraps himself in that Green Jacket. He is my top play at the top this week. From a cash game perspective, one name always pops off the page here at Augusta. Casey not only returns with some excellent course history but he is also a bargain in the high $8K/low $9K range. He has been incredibly consistent here at the Masters lately with a T15, T6, T4, and T6 in the last four years and has made the cut in nine of 12 career trips with five Top 10's. Making cuts has kinda been Casey's thing as he has missed just five since the start of the 2017 season(55 events). At these prices, I will have exposure to Casey in all formats. I also love the value with Matsuyama this week who checks almost every single box starting with that mid-tier price. Hideki wasn't great here early in his career with a T27 and T54 in 2011/2012 followed by a missed cut in 2014 but since he has been terrific with four straight Top 20 finishes with two Top 10's mixed in there as well. He comes into this week in good form as well having made all 10 cuts this season and coming off a T8 at the PLAYERS where he shots 66/67 in the final two rounds and gained 3.6 strokes putting. If he gets anywhere near those putting numbers this week, he will be near the top of the leaderboard come Sunday. He is in play in all formats. The value just keeps coming as Kuchar enters this year's Masters with a sub $8K price tag once again. For the most part this week, at least in cash games, I am looking for players with good course history plus some form coming in and Kuchar checks both of those boxes. He had early success here with a T21 in 1998 in his first appearance but then finished T50 the next year and missed the cut in 2002. He didn't return again for eight years but everything clicked from there as he has made the cut in nine straight years including four Top 10 finishes. He is similar to Casey in that he is very consistent making cuts but was never really considered a "winner" with that changing recently. He has made all 11 cuts this season with two wins(Mayakoba Classic, Sony Open) and five Top 10's. At these prices, he is a core play for me in all formats. Looking at the salary to odds differential on my sheet, Kevin Kisner stands out as the top value on both sites. He is 27th in odds to win but 52nd in DK salary and 46th in FD salary. Wait, there is more. He is fresh off his win at the WGC Match Play and had finished T28 or better in six straight stroke-play events going back to the Waste Management Phoenix Open. He has yet to break through here at Augusta but has made all three cuts with a career-best T28 last year. I feel that is his floor this year and anywhere near a Top 10 would crush value at these prices. He is fresh off his first career win last week at the Valero Texas Open which put him in this year's Masters field. The form before the win was pretty ugly with missed cuts in five of six events prior but looking at his stats(last 24 rounds), he is 10th in SG: Ball Striking(10th in OTT, 14th in APP), 14th in SG: par 4, 23rd in Bogeys Avoided, and while he is down in 46th in BoB Gained he is 7th in opportunities gained. I love upside and the price and will have Conners in my value core for GPP formats this week.